The Passolig protest rages on in Turkey, severely damaging the image of Süper Lig. 9 weekends into the season attendance statistics are slightly improving for some clubs, but overall are still a shame overall. What used to be a league growing every season, pulled upwards mostly by the successful powerhouses from Istanbul, now is a disturbing sight. Most clubs have so far lost somewhere between 40 and 60% of their last year’s following, but record-holding Gençlerbirliği is down by over 90%. Below is the complete table showing changes compared to last season, produced by Yeni Şafak. Several interesting things can be seen in the table. Second largest crowds are seen at Konyaspor, the very single club that actually sees increase in turnout. 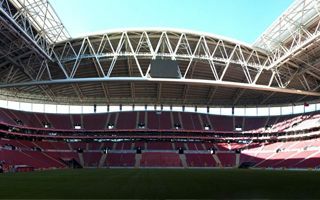 But there’s a very simple reason for this number: the club moved to one of the most modern and largest stadiums in Turkey and fans had to join the Passolig system to actually see it live. But only an 8% increase since last season means that vast majority of the seats in Konya are empty. Suddenly fifth “most-supported” club in Turkey’s top league is Balikesirspor, a side who are enjoying turnouts of under 10,000 after they returned to the Süper Lig after 40 years of underperforming in as low as the fourth tier. What may not be so clearly visible from the thousands of fans not attending games are millions lost in revenues. In this case Galatasaray is paying the highest price for Passolig boycott. Their average of under 13,000 per game barely allows to cover organizing costs, while two years back they were worrying whether 200 skyboxes will be enough to cater for demand. The league is in a spot where camera operators, and this is true, are asked to focus on the field and show as little of the empty stands as possible. Because even when there’s significant number of fans inside, they’re almost never occupying the lower rows and visually the TV product ends just behind the pitch. Perhaps ironically, the third league is suddenly growing to be a major product in this (sur)reality. Galatasaray may have Sneijder, Melo, Muslera or Pandev on their team roster, but they’re currently enjoying crowds comparable with third league side Sakaryaspor, who are known internationally only for… their vocal supporters. In fact there’s a significant growth in popularity of clubs that aren’t part of the Passolig scheme (from third league downwards). It has to be said that the number of Passolig cards issued to top two league fans is growing, though. It passed the half-million mark recently and that would be a good thing for system operator Aktifbank, but isn’t as much as one might think. First of all, the system regularly crashes, causing people who forced themselves to become Aktif’s customers to stay locked outside their respective stadiums. Moreover, the number of cards issued is also being tweaked by companies or public institutions buying cards for their subordinates in bulk. Which explained appalling attendances even at the club that supposedly has most Passolig cards bought. Officially Galatasaray supporters own over 112,000 cards, while their home crowd still is just over 12,000. It’s clear however that more and more cards will be issued, because the boycott doesn’t only hit league operators and clubs. It also hits the fans, who deprive themselves of following their beloved clubs. So with each promotion, stadium opening (and Turkey is building more than any European country) or great derby game the number of people letting go will be growing. Just like at the Sunday’s Fenerbahce – Eskisehirspor game on Sunday, when attendance is expected to highly exceed the average turnout so far. The good news for protesters is that their fight will end some day. The bad news: it may not be this season. The Turkish FA (TFF) insists Passolig stays, but court battle goes on. Recently a consumer court decided that the entire Passolig scheme isn’t only a matter of consumer rights, but indeed of human rights. The Supreme Court will take the issue up on June 30, 2015. Why protest in the first place? Boycott and street protests in Turkey were launched in reaction to details of the new personal identification scheme. Individual tickets were merged with ID cards and these ID cards with… banking services. Although it’s not regulated by legislation itself, the TFF chose a commercial bank to operate their ID system. And Aktif bank made the scheme much more difficult for fans than some similar fan ID card schemes across Europe. If you want to buy a ticket, you have to become a customer of Aktif. You may have a bank account somewhere else, but Aktif will still give you a card of their own, charge money for it and then charge you again and again for games you follow. And you may be underage as well, there’s no choice. At the same time, which may raise even more eyebrows, the bank has full database of football supporters. It doesn’t only require fans to submit what the law obliges them to (name, ID number and photo), but also address, telephone and other data.